← Dale Yu: Review of Memoarrr! I was approached by Hasbro to try out their new Alexa app to be able to play Trivial Pursuit at home using my Alexa device as the moderator. Our kitchen already has an Amazon Echo in it, so with the addition of a pair of Echo Buttons to use as buzzers, we were ready to play. 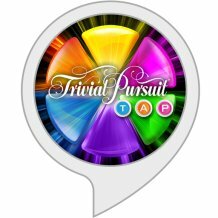 Trivial Pursuit Tap is an Alexa Skill, and it can be launched by simply saying “Alexa, start Trivial Pursuit Tap”. It will make sure that your two Echo Buttons are linked to the device, and then you’re off and running. Split your group up into two teams, and give an Echo button to each team to act as the buzzer. Alexa will tell you the category of the question and then she will read off the question. Once someone thinks that they know the answer, they hit their Echo button to be able to give the answer out loud. Alexa acts as judge and jury and tells you if you are right or not. When you answer a question right, you then have the opportunity to answering questions alone until you get one wrong. The questions are in a number of different categories, but from my initial plays of the game, they might as well all be called “21st Century pop culture”. Alexa might tell you Sports or History, but be prepared for a question involving a movie, television show or music group despite that. It’s hard for me to gauge the level of difficulty – but I can tell you that my two teenaged kids are pretty much unable to play as they simply don’t have enough pop culture background to compete. As with most Alexa skills, there is also the ever present issue of relying upon Alexa to hear your answer and to be able to interpret whether it is right or not. We have had a number of occasions where Alexa tells one player that they have the wrong answer only to give the next player – who says the identical words of the previous answer – credit for a correct answer. I’m not sure how Alexa parses the answers (if at all), but this is a frustrating part of the game. Also, the initial version of the Alexa Skill could hijack your Alexa device. Theoretically, you could quit by telling Alexa to stop the game. However, more often than not, Alexa would think that you were trying to answer the current question and simply tell you that you were giving the wrong answer. The only way to get out of this loop was to unplug the Alexa device to reset it. Since then, my Alexa hears the quit command occasionally, but we still sometimes have to unplug it. The reason that this comes into play is that the length of the game is pretty long – and there are times you just want to play for a bit and then move onto something else. I do wish the game had a couple of improvements. First, I would like there to be some way to select the length of the game. This would be useful, especially given the quitting issues outlined above. Second, it would be nice to have a difficulty setting. As it stands now, you can’t really play this with kids or teens or people who aren’t adept at pop culture. Having a different set of questions would help make this more accessible. The Echo Buttons work great, and at the time of release, there were only three other games that you can play with the buttons. However, as I check the Alexa page about twice a month, each time I have noticed at least one more Buttons game available for play. At last check, there were ten different activities.